In 1979 at age 19 I was admitted into the ER at Sunnybrooke Medical Center in Toronto. The diagnosis was "End Stage Renal Failure". Without emergency "dialysis" treatment I would be dead in a matter of hours. It was a full-blown "Near Death Experience". It was hastily decided that I would require surgery to initiate a "Shribner Shunt" that would allow immediate life-saving dialysis. It was do or die! Emergency surgery to initiate a "Shribner Shunt" allowed immediate life-saving dialysis therapy. Despite the gravity of the situation, it was the best news I could have hoped for that day. Sure beat the obvious conclusion of any further procrastination. It would NOT have been pretty. 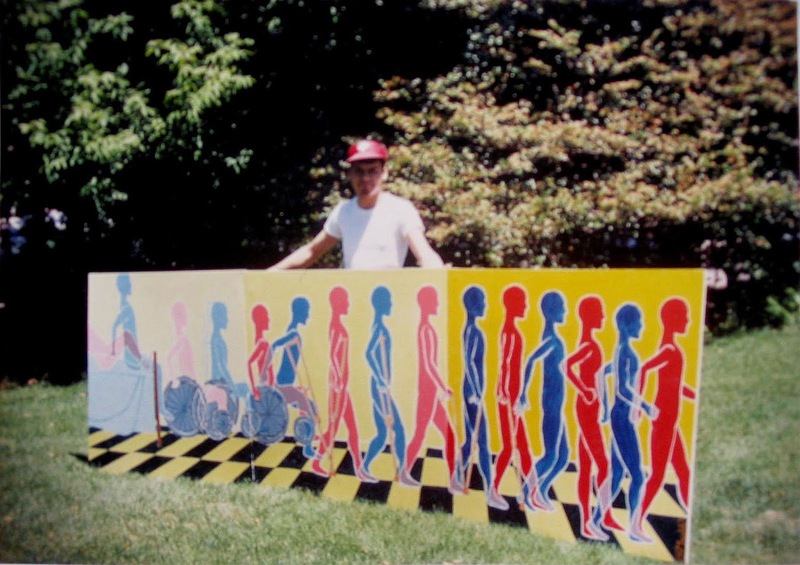 Once I was feeling marginally better a couple of months later, I designed and painted a mural called "Recovery 1", which I donated to the hospital that saved my life. Talk about grateful. My desire with the mural was to inspire everyone who saw it to strive toward their own recovery in whatever form. "Recovery 1" designed and painted at age 19 in Toronto. Only 7 months after being admitted (though admittedly if felt like an eternity) my brother Steven stepped up with incredible courage and generosity to donate a kidney to me. This Gift of Life sustained me for over 34 years, a longevity record in Western Canada! 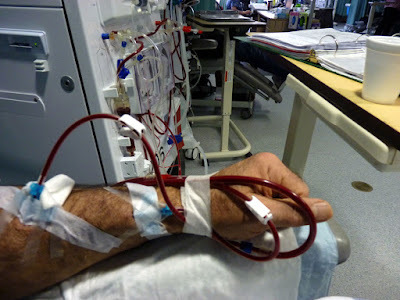 It was in mid-May of 2014 that my transplanted kidney finally gave up the ghost and I was obliged to return to thrice-weekly dialysis treatments. It was a glorious time. Other than twice annual check-ups and diligent compliance with my anti-rejection medications, it seemed like an ordinary, healthy life. Having said that, the contrast between living dialysis free and dialysis dependent could not be more marked! I decided at the time of my Near Death Experience...at age 19...that I would not leave this planet without creating a lasting impression of my time here. The concept of mural-painting as a way to accomplish this was rather self-evident...so mural-painting it was! This link will steer you to my mural-painting portfolio. Three times a week for 4 hours each time...dialysis is a life-saving intervention as I await a 2nd Gift of Life. Fast forward to 2015. Once I realized that my fate was sealed to return back to dialysis, I began to contemplate a revised design for my notorious "Recovery" motif. 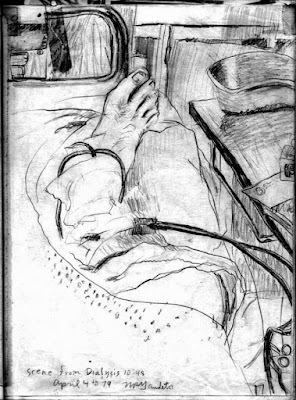 Thus, "Recovery 15" was created. This time around, I specifically included a kidney embedded into the lower right abdomen of the final figure on the far right and that figure is striding energetically off the canvas. My vision for this latest mural is for it to stand as a powerful "Visual Prayer" for my own (eventual, God willing) second "Gift of Life" aka a second kidney transplant! I also want this image to be a source of inspiration for EVERY dialysis warrior who is on that challenging quest for a "Gift of Life". In "Recovery '15, the figure on the far right strides off the canvas with the "Gift of Life". 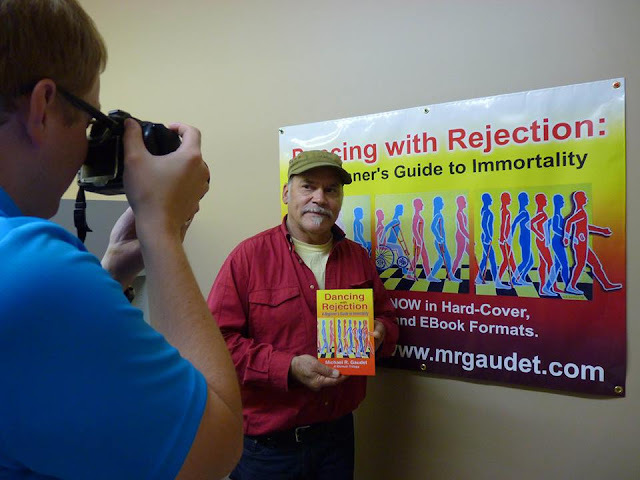 As another bid for "immortality" I was compelled to write my memoir that would chronicle my Near Death Experience and my triumphant kidney transplant. The book would also track my rise to become one of Canada's most successful painter of monumental-scale murals. The book explores the bohemian times of the 60's through to the 80's in cities across Canada. Titled "Dancing with Rejection: A Beginner's Guide to Immortality", please visit www.mrgaudet.com to read more about this project and to purchase a copy. It's only one click away. It was a natural, organic decision to incorporate the image of "Recovery '15" as the cover art for my 1st book. What better way to spread the "Visual Prayer" across the globe to be a catalyst for the millions upon millions of dialysis warriors to continue on their harrowing quest for that elusive Gift of Life that has the potential to lead to a healthy, robust life, freedom from the machine? "Recovery '15" was the natural choice to become the cover art for "Dancing with Rejection..."
I decided to add this image to my Fine Art America portfolio so now, it is readily available as a museum-quality replication. Steer your search engine here to see all of the available formats. I am doing my part with this image to continue, as a working artist, to raise awareness of kidney health. It is an undertaking that looms large in the world, as millions of everyday people...your brothers and sisters, husbands and wives, sons and daughters, loved ones and friends...continue to grapple with kidney disease and its fallout every day. God help us all.